Using a library of more than 10,000 deep-sea corals collected by Caltech's Jess Adkins, aninternational team of scientists has shown that periods of colder climates are associated with higher phytoplankton efficiency and a reduction in nutrients in the surface of the Southern Ocean (the ocean surrounding the Antarctic), which is related to an increase in carbon sequestration in the deep ocean. A paper about their research appears the week of March 13 in the online edition of the Proceedings of the National Academy of Sciences. "It is critical to understand why atmospheric CO2 concentration was lower during the ice ages. This will help us understand how the ocean will respond to ongoing anthropogenic CO2 emissions," says Xingchen (Tony) Wang, lead author of the study. Wang was a graduate student at Princeton while conducting the research in the lab of Daniel Sigman, Dusenbury Professor of Geological and Geophysical Sciences. He is now a Simons Foundation Postdoctoral Fellow on the Origins of Life at Caltech. Biological processes are the main driver of CO2 absorption from the atmosphere to the ocean. Just like photosynthesizing trees and plants on land, plankton at the surface of the sea turn CO2 into sugars that are eventually consumed by other creatures. As the sea creatures who consume those sugars—and the carbon they contain—die, they sink to the deep ocean, where the carbon is locked away from the atmosphere for a long time. This process is called the "biological pump." 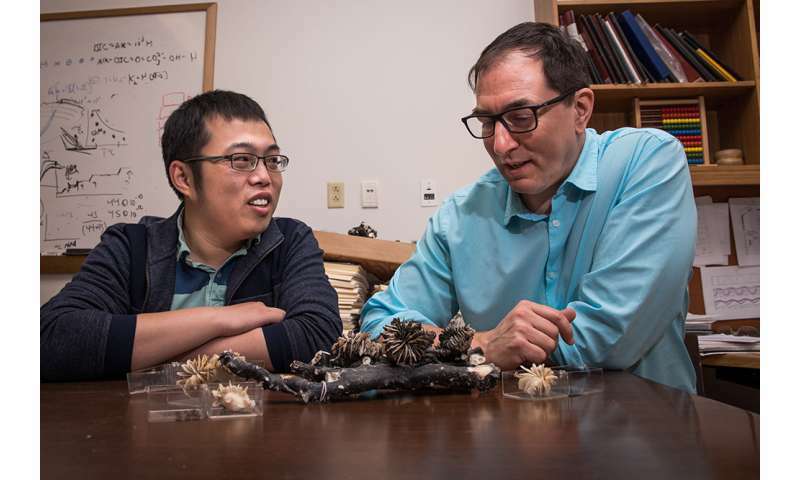 "Finding a few centimeter-tall fossil corals 2,000 meters deep in the ocean is no trivial task," says Adkins, Smits Family Professor of Geochemistry and Global Environmental Science at Caltech. Wang analyzed the ratios of two isotopes of nitrogen atoms in these corals - nitrogen-14 (14N, the most common variety of the atom, with seven protons and seven neutrons in its nucleus) and nitrogen-15 (15N, which has an extra neutron). When phytoplankton consume nitrogen, they prefer 14N to 15N. As a result, there is a correlation between the ratio of nitrogen isotopes in sinking organic matter (which the corals then eat as it falls to the seafloor) and how much nitrogen is being consumed in the surface ocean—and, by extension, the efficiency of the biological pump. The study is titled "Deep-sea coral evidence for lower Southern Ocean surface nitrate concentrations during the last ice age." Iron fertilization less efficient for deep-sea carbon dioxide storage than previously thought?